Two weeks ago, I told you about a product that will help you get rid of the pile of junky paint cans that have been hanging out in your garage. The Dipsy Dabber is a perfect solution for neatly storing leftover paint and making touch-ups simple! Check out the video on how it works here. 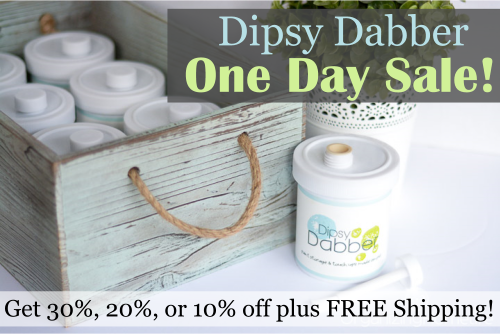 Dipsy Dabber is offering Organizing Homelife readers an exclusive sale that has never before been offered. It will be available tomorrow only: Thursday, November 3, 2016. The sale begins at 7:00 a.m. Eastern Time. The sale percentage will drop throughout the day, so set an alarm on your phone so you don’t miss it! All sale times are in Eastern Time Zone. BONUS! If you buy three or more Dipsy Dabbers, you’ll receive FREE SHIPPING. You seriously cannot miss this deal!